The hearing of the President of the Senate, Bukola Saraki’s appeal at the Federal Court of Appeal, Abuja on Thursday, against the Code of Conduct Tribunal (CCT) has been stalled again. The News Agency of Nigeria (NAN) reports that the inability of the court to sit on the matter stemmed from a reported ill health of the applicant’s (Saraki) counsel, Chief Kanu Agabi (SAN). The Senate President is being tried at the tribunal for alleged false and anticipatory declaration of his asset while serving as governor of Kwara. The Federal Government had also alleged that the applicant violated the country’s Money Laundering law. However, Saraki, who denied any wrong doing, is challenging the jurisdiction of the CCT to try him. Agabi had transmitted a letter to the presiding Judge, Justice Abdul Aboki, seeking an adjournment on account of his ill-health. “In view of the letter sent to this panel from the applicant’s counsel, Chief Kanu Agabi, seeking adjournment on account of ill health and since this prayer is not opposed, the court will grant it. 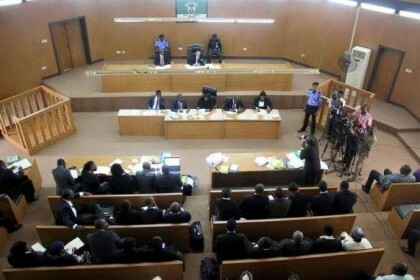 “The hearing of the appeal is hereby adjourned until July 18,’’ Aboki said.